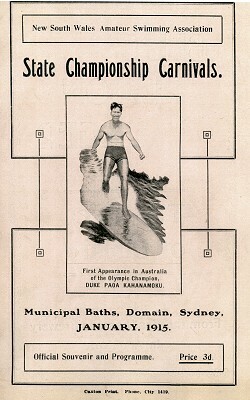 State Championship Carnivals Programme, January 1915. 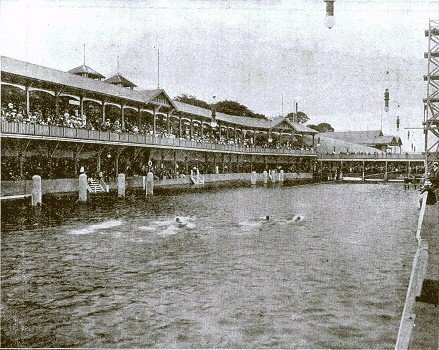 Municipal Baths, Domain, Sydney, January 1915. Caxton Print, Phone City 1419. The publication strongly featured the touring Hawaiian party, the three photographs appear to be taken after their arrival in Sydney, and the program was printed after the 30th December when the heats for the 100 yards championship were decided, see page 17 Event No. 7. The Domain Baths were possibly some of the best facilites available in the world at this time. the high diving tower to the far right. The organisers have attempted to provide a competitive program balanced with novelty items to provide a broader level of entertainment. Examples include Band performances at the three carnivals (extensively detailed on page 9, not reproduced here), Musical Lifebuoys (first and third carnivals), Novelty Race/Event (second and third carnivals) and the High and Acrobatic Diving Displays at all the carnivals. While the nature of the novelty events and Acrobatic Diving Displays are unspecified, the format for the Musical Lifebuoys is detailed below on page 17, Event No. 6. Note that, below this event, provision has been made in the program for the spectator to complete the results. This formatting appears in conjunction with all the events that are specified as finals. In the list of NSW swimming officials on page 3, note that two representatives, C. Healy and F. Williams, had significant roles in the surf-shooting and the surf lifesaving movement. Cecil Healy was a member of the Manly Surf Club, competed at the 1912 Olympic Games against Duke Kahanamoku and was later a journalist. 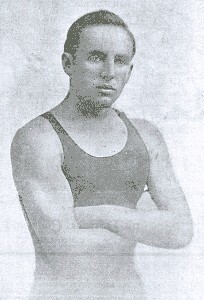 F. C. (Freddy) Williams was also from the Manly Club and considered the best of the early surf-shooters. In the 100 yards NSW Championship on 2nd January (page 17 Event No. 7), the race was won emphatically by Duke Kahanamoku in a new world record of 53 4/5 seconds, breaking his own previous world record (54 3-5 seconds) by almost a full second. The significance of such a performance echoes Duke Kahanamoku's initial forays at competitve swimming. When the results were forwarded to sceptical US authorities for recognition, Mr. Sullivan, a respected and experienced official, commented "world's records are broken by fractions, not seconds." 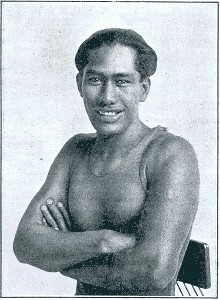 Duke Kahanamoku in Australia : January 1915. The difficulty in aligning metric and imperial distances is evident. The European metric system was used for Olympic events while the imperial system was used in England, United States and Australia. On page 11, A. W. Barry is noted as the "holder of 100 yards and 100 metres Australian records." Officers of the N.S.W. A.B.A.. 1914.15. First Day's Programme, January 2nd. ISecond Day's Programme, January 6th. Third Day's Programme, January 9th. F. Evans (Manager), Duke Paoa Kahanamoku, and G. Cuhna. the high diving tower, far right. Patron- His Excellency the State Governor. Chairman of Council- Mr. E. S. Marks. Hon. Treasurer- Mr. C. D. Jones. Hon. Assist. Secretary- Mr H. R. Kelly. Hon. Secretary- Mr. W. W. Scott. Hon. Handicappers- Messrs. H. Smith and F. Cummins. Hon. Registrar- Mr. N. J. H. Langtry. 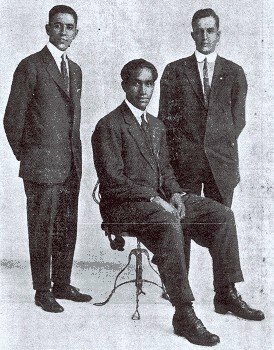 Executive Committee- Messrs. W. W. Hill,. O. Read, R. N. Beale, E. C.
Fox, J. McClenahan, Hon. Treasurer, and Hon. Secretary. Hon. Auditors- Messrs. W. H. Hodge and J. W. Crane. SATURDAY AFTERNOON, 2nd JANUARY, 1915. Commencing at 2.30 p.m. 1. Heats of 50 Yards Junior Handicap. 3. High and Low Springboard Diving Competition. 4. Heats of 100 Yards Inter-Club Handicap (9 to 17). 5. 100 Yards Championship of the Country. 7. 100 YARDS CHAMPIONSHIP OF NEW SOUTH WALES. 8. Final of 50 Yards Junior Handicap. 9. Semi-Finals of 100 Yards Inter-Club Handicap. 10. High Tower Diving Competition. 11. 880 Yards Kieran Memorial Sratch Race. 13. Final of 100 Yards Inter-Club Handicap. 15. 220 Yards Invitation Teams Relay Race. 16. 880 YARDS CHAMPIONSHIP OF NEW SOUTH WALES. Event No.6. MUSICAL LIFE BUOYS. One Trophy. Post Entries. Competitors will be required to swim round lifebuoys without touching until the music stops, and then bob under the water and into the buoy. Event No.7. 100 YARDS CHAMPIONSHIP OF NEW SOUTH WALES. Holder of Title- A. W. Barry. Records- English, 55 2-5 seconds, C. M. Daniels, on 7th September, 1907. American and World's, 54 3-5 seconds, Duke Paoa Kahanamoku. Australian, 56 3-5 seconds, A. W. Barry, 1st February, 1913. Standard Time, 1 min. 3sec. Event No. 14. DISPLAY OF HIGH AND ACROBATIC DIVING. Event No. 15. 220 YARDS INVITATION BRACE RELAY SCRATCH RACE. WEDNESDAY EVENING, 6th JANUARY, 1914. ORDER OF EVENTS. Commencing at 8 p.m.
1. Heats of 220 Yards Inter-Club Relay Handicap. 2. Low Springboard Diving Competition. 3. Heats of 110 Yards First Class Handicap. 4. 220 YARDS BREAST-STROKE CHAMPIONSHIP OF N.S.W. 6. 110 Yards Ladies' Invitation Handicap. 7. Final, 220 Yards Inter-Club Relay Handicap. 8. High Springboard Diving Competition. 9. Final, 110 Yards First-Class Inter-Club Handicap. 11. 440 YARDS CHAMPIONSHIP OF NEW SOUTH WALES. SATURDAY AFTERNOON, 9th JANUARY, 1915. 1. Heats of 75 Yards Junior Inter-Club Handicap. 2. Heats of 100 Yards Inter-Club Handicap (1 to 5). 3. High Tower Diving Competition. 4. Heats of 100 Yards Inter-Club Handicap (6 to 10). 6. 220 YARDS CHAMPIONSHIP OF NEW SOUTH W AlJES. 8. Final 75 Yards Junior Inter-Club Handicap. 10. DIVING CHAMPIONSHIP OF NEW SOUTH WALES. 12. 100 YARDS JUNIOR CHAMPIONSHIP. 15. 500 YARDS TEAM'S CHAMPIONSHIP OF NEW SOUTH WALES. Event No.6. 220 YARDS CHAMPIONSHIP OF NEW SOUTH WALES. Holder of Title: W. Longworth. Records: Australian, 2 mins, 28 2-5th secs. by B. B. Kieran, 6th December, 1905. 2 mins. 28 2-5th secs., by F. de Beaurepaire, 2nd Feb., 1910. English, 2 mins, 28 3-5th secs., by C. M. Daniels, 26th March. English, 2 mins, 28 3-5th secs., by F. C. V. Lane, 18th August, 1902. American-World's-2 mins. 25 2-5th secs. by C. M. Daniels, 26th March, 1909. Standard Time: 2 mins: 40 secs. Official Souvenir and Programme. Price 3d. Geoff Cater (2007) : E.M. Parker : Surf-riding at Waikiki, 1852.